The study of geography stimulates children’s interest in the world around them. At Sea Mills we aim to develop their understanding through the study of places, the human and physical processes which shape them, the plants and animals in different environments around the world and an awareness of the life and culture of people in other places. We develop a range of geographical enquiry skills, teaching pupils to read and interpret maps, plans and photographs, to undertake field visits and practical studies to enhance understanding of the local area and learn about geographical features in the landscape. 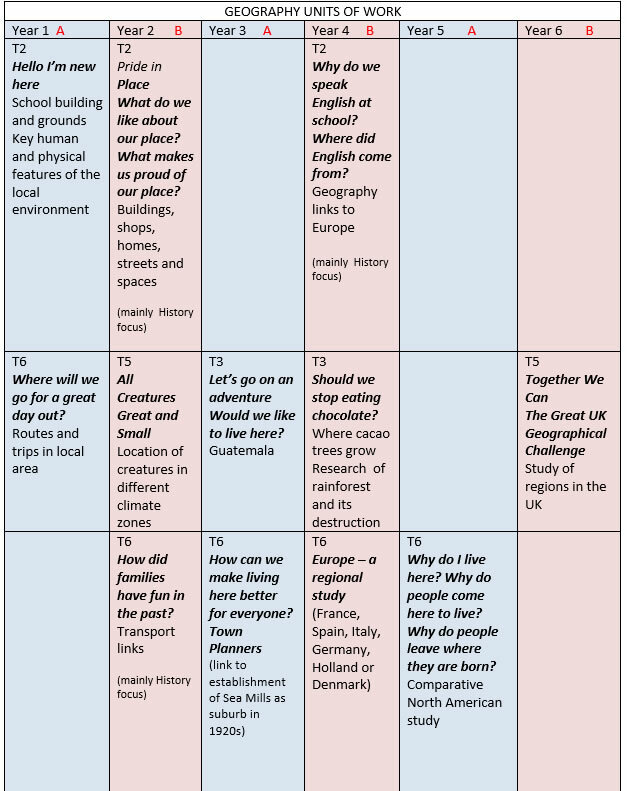 Geography is taught throughout our school as part of a series of enquiry units, over a two-year cycle, with a main geography focus at least once a year and geographical links highlighted in other units. All units start with a question that will be answered through the study and a ‘wow day’- an experience that is designed to stimulate interest and curiosity. We provide opportunities for cross-curricular links to be made, especially through applying maths and science skills (for example, learning about grid references when reading maps). Our geography curriculum is further enriched through undertaking field trips in the local area, looking at the way people use the local landscape as well as how rivers came to affect the local way of life. Your child will be asked to carry out research during enquiry units using the local library and the internet. Please help them to find relevant information. Our local area has a diverse geography particularly with its access to rivers and proximity to Wales and the South West. Enjoy days out with the family and encourage your children to recognise places of interest and explore the environment.